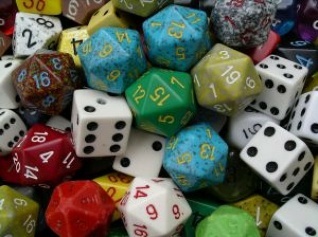 Dice Games Rules Scoring & Tips are described at gamerisms for a list of 10 popular dice games played worldwide. Poker Dice and Yahtzee are at the top of this skill games list followed by Boggle, Bunco, Farkel, Kismet, Stack and Shut the Box. Sicbo and Craps, likely the most recognized true gambling games complete the list of 10. Scoring and playing tips are described for all these unique skill games. Another common feature of dice games is that the enjoyment and excitement of play is shared by passionate gamers worldwide and deserves a spot at gamerisms skill games section. Let's begin with the familiar game of Poker Dice, available online and off. Poker Dice is one of the most famous dice skill games. Dice used in the game is a six-sided cube displaying cards instead of numbers. Each of the six sides represent Ace, King, Queen, Jack, Ten and Nine used to form a Poker hand in order of rank. In order to win the game, a player has to roll the best poker hand combination. After ante, each player then rolls five dice in turn and plays for the best combination with maximum points in different rows. Each player takes three rolls of the dice and can save any one dice from the previous roll. Once a dice has been placed aside, it cannot be rolled again for that player’s turn. At the end, the player who gets the maximum points wins the game. The game begins with no score for all the players. At the start of the game, the dice is rolled and the player decides which row has the best combination. To understand how points are distributed, there is an explanation of 13 rows in a table and their descriptions below to show the scores and the method of calculation. Ones=Sum of all 1’s in a row. Twos=Sum of all 2’s in a row. Threes=Sum of all 3’s in a row. Fours=Sum of all 4’s in a row. Fives=Sum of all 5’s in a row. Sixes=Sum of all 6’s in a row. Chance=any dice combination can be used=a sum of all the dice. The scoring and points table above is applicable only if the dice combination fulfills the row conditions mentioned. If the condition does not match, the player receives no points. 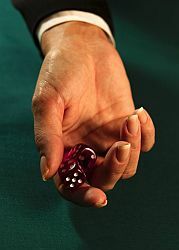 If a player is not satisfied with the combination on a roll, he/she is allowed to select one or more dice and attempt another roll with the dice chosen. This game strategy is allowed to be used a maximum of 2 times then the player must choose the resulting combination without making any changes to it. Yahtzee was created by Milton Bradley in 1973 and later purchased by Hasbro Inc. Along with the classic version comprised of die and scorecards, Yahtzee products have evolved to include a dice holder, dice tray, travel edition, key chain and a popular slot machine. This recognizable brand of dice games is played with five die that are rolled at once. The rolled combinations determine the points scored by the player. The object of Yahtzee is to score a maximum of 375 points on a single roll. Players roll the dice three times and select the best combination to receive maximum points. The game ends after 13 rounds and scores are tallied to determine a winner. The scores of all rounds are entered in a score sheet or a scorecard. All 13 dice patterns are published along with an empty box where the score for each round is entered. The maximum of 375 points that can be achieved by scoring 5 aces along with other combinations to a max of Yahtzee which is a 50 pointer. The lowest possible score is 5 with a roll displaying five 1’s. The probability of a Yahtzee for any three rolls would be approximately once (1) in 22 attempts. And the probability of it on the first roll of any turn is high at 1 in 1296 attempts. Thus, a player's choices after their roll by saving or tossing dice combinations rolled is critical and the reason Yahtzee dice games are considered skill games. Yahtzee has been described as a tactical, strategy and a mind game, however the global appeal of the game beats everything else. This classic game available online and off consists of 16 dice cubes marked with a different letter of the alphabet on each of the 6 sides of an individual dice. Scoring is determined by the number of words consisting of 3 letters or more that are formed after a player's roll. Words can be formed by joining letters up, down, side-to-side and diagonally. The longer and more unusual the words the higher your score. with a target number of 1 to 6 for each round. Players who roll the designated target number score a BUNCO! For example, rolling three 4's in Round 4 or three 6's in Round 6 is a Bunco. The player must call out Bunco to receive 21 points on the score card. Otherwise, rolling three of a kind other than the target number of the round scores 5 points. For example, rolling three 6's in Round 4 is worth 5 points. Round: is a full turn of the target numbers rolled. Each set is broken down into 6 rounds. Set: Bunco is divided into 4 sets. 1 Set equals 6 rounds. Roll-Off: in the event of a tie, a Roll-Off is one complete turn around the table. The team/player with the most points after the Roll-Off is the winner. Luck meets skill with the tri-colored dice game of Kismet. The game is played with 5 tri-colored dice and scoring is determined by color and number combinations rolled. and add bonuses for their total game score. The player with the highest total score wins the game. If Yahtzee is a favorite of yours, you are likely to enjoy the game of Kismet also. Farkel combines poker, skill and risk to create a high-scoring dice game. Players roll six dice with the goal of scoring points for combinations of 4-of- a-kind, a straight, flush, etc. You continue the roll until a combination appears with no scoring combinations known as a Farkel at which time you lose all points gained in that turn. The risk comes into play when after each toss the dice, you are faced with the 'take the points or gamble for more' question. The first player to score over 10,000 points wins. Shut the Box is played with a unique set of hinged tiles numbered 1 to as high as 12 along with the required dice set. Also called Tric-Trac, Canoga or Batten Down the Hatches, the road to a win for this game is to 'Shut the Box' before your fellow challengers. Each player rolls the dice and lays down any combination of tiles that match the roll. Thus, if your roll is a 7, you can either flip up the 7 tile, or the 5 and the 2, or the 4, 2, and 1 tiles. In the event that every tile higher than 6 is covered, the player has the choice of rolling one or two dice. Your roll continues until no match can be made on the remaining tiles at which time, your score is recorded. All the tiles are flipped up, and the turn passes to the next player. After each player has played, the game is over, and the low score wins. Any player who flips or lays down all the tiles has "Shut the Box". This skill game merges strategy, defense, stacking dice along with a pile of colored dice to create rolling good times. The winner is determined by the highest number of points. Each player has 14 dice of one color in play. Each stack set of 56 dice is divided into 4 colors: red, yellow, blue and white or black, purple, green, and pink and 1 Stack Sack (say that 3 times). Once the dice is rolled by each player and the first challenger to play is determined, a clockwise rotation ensues. The first player then stacks their opponent's cubes with the same number. Example: 5 on top of 5 facing up, etc. Once stacked, the cubes cannot be moved or relocated. A player cannot stack directly on top of their own cube, however is allowed two of their color dice in a stack. Once a fourth cube is stacked, that pile is captured it and taken out of play while the points are credited to the player who placed the last or fourth cube on the stack. Instead of stacking, dice can be selected and rolled for a higher number, however that roll must be used or that turn is over. When a player is about to stack his/her last die, the other players are notified. This player about to stack the last die and the opponent who received this stack are then out of the round and the remaining players are given one last turn. Afterwards, the round ends and scores are tallied. Each stack of two or more dice belongs to the player whose color is on top. Dice Games Rules: Stack Scoring: All dice/cubes are face value except for the 1 that has a value of 10.
a) if a player rolls a die and knocks a stack over, he/she loses a turn and must roll a die and subtract the amount from their score. If that stack cannot be rebuilt, the player loses an additional 10 points. b) if a player picks up an opponent's colored die by mistake she or he loses a turn. If a player accidentally rolls the opponent's die, the opponent has the option to keep the new number or return it the original number. c) If a player goes out of turn, he or she loses a turn. The modern version of this skill game is played with three dice and a cage shaker, played on a table with pictures displaying the 50 possible bets and their corresponding payouts. Sicbo means dice pair but there is an element of intrigue here in the form of the third die. This skill game with a long history has evolved into a game of worldwide interest and is offered at many online casinos today. The goal of the game is to bet on the possible results or a combination of results based on the three dice. Players bet their chips on any of these pictures on the table. The dealer then shakes the dice in the basket and rolls them out. If a winning combination is hit, the picture square lights up and the player is paid accordingly. The odds and accordingly the house edge are calculated based on the complexity of the prediction or bet. Example: Bet=Total score will be between 11-17 inclusive. Exception is a triple. Thus, if a player places his/her bet on the sum total of the result being between the numbers 11 and 17, this example considers all possible combinations of numbers on the three dice. Adding up to these digits turns out to be almost 50%, thus, the odds are 1:1 or hit or miss. The odds fluctuate between 1:1, 1:1, 10:1, 30:1, 60:1 to 6:1, 6:1, 7:1, 30:1 and 50:1 respectively. The odds listed here might not be the same in every casino as individual casinos set their own house edge based on the skill level of the game. This list concludes with by far the most popular and recognized of the dice games, craps. There is a 3-part craps glossary, facts trivia report and a craps quiz at the site. The rules of the game are described below briefly along with links to more craps info. Let's run through the numbers=2, 3, 12 are craps-losers. 7 and 11 are natural winners. 10 Dice Games detailed in this Dice Games Rules glossary are Poker Dice, Yahtzee, Boggle, Bunco, Farkel, Kismet, Stack and Shut the Box. Sicbo and Craps complete the list of 10. There is also a 3-part Craps glossary, facts-trivia report and quiz at the site.